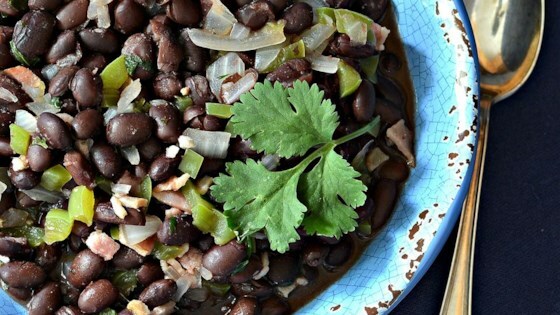 "Traditional Brazilian black beans (feijoada) can take quite some time to prepare. Considering I spend most of my time chasing after 2 small children, I've come up with this recipe for a very quick feijoada. This goes very well with white rice." Cook bacon in a pot over medium heat until almost crisp, 3 to 5 minutes. Add onion and green pepper to the bacon; cook and stir until onion is translucent, about 5 minutes. Mix in cilantro, garlic, and bay leaf; cook and stir until flavors combine, 1 to 2 minutes. Stir beans, chicken broth, vinegar, salt, pepper, and hot sauce into the onion mixture; cover and let simmer until the flavors combine, 10 to 15 minutes. Add more chicken broth if you would like the beans to be more soupy. Great recipe. Easy, quick, cheap, and adaptable. Made as directed. Tasted great. Added some liquid smoke to the leftovers - even better! Great quick and easy dish. I’ve made it multiple times in just one month!